Art is a form of creative human expression, a way of enriching the human experience. We use art for our entertainment, cultural appreciation, aesthetics, personal improvement, and even social change. Whether or not we are aware of it, we allow art to affect our lives one way or another. 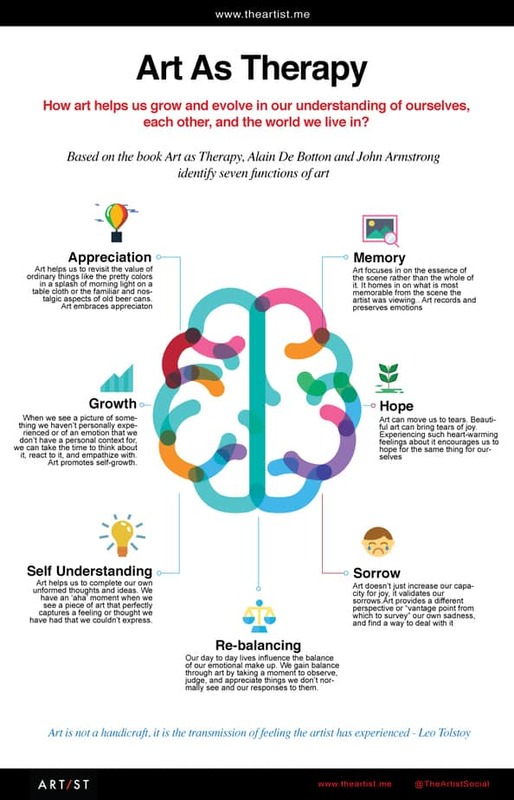 In their book, Art as Therapy, Alain De Botton and John Armstrong identify seven functions of art. They explain how art helps us grow and evolve in our understanding of ourselves, each other, and the world we live in. In viewing art, our perceptions change and grow, leading to growth and change in ourselves. Art helps us to revisit the value of ordinary things like the pretty colors in a splash of morning light on a table cloth or the familiar and nostalgic aspects of old beer cans. Art embraces appreciation. Art focuses in on the essence of the scene rather than the whole of it. It hones in on what is most memorable from the scene the artist was viewing. Art records and preserves emotions. Art helps us to complete our own unformed thoughts and ideas. We have an ‘aha’ moment when we see a piece of art that perfectly captures a feeling or thought we have had that we couldn’t express. Art doesn’t just increase our capacity for joy, it validates our sorrows. Art provides a different perspective or vantage point from which to survey our own sadness, and find a way to deal with it. Art can move us to tears. Beautiful art can bring tears of joy. Experiencing such heart-warming feelings about it encourages us to hope for the same thing for ourselves. When we see a picture of something we haven’t personally experienced or of an emotion that we don’t have a personal context for, we can take the time to think about it, react to it, and empathize with. Art promotes self-growth. Our day-to-day lives influence the balance of our emotional makeup. We gain balance through art by taking a moment to observe, judge, and appreciate things we don’t normally see and our responses to them. Recognizing and remembering these seven functions of art as therapeutic tools for personal growth the next time that you encounter art will hopefully enhance your experience of the image you are looking at. Taking the time to mindfully observe artwork is shown by the authors of Art as Therapy to be of true value to your emotional well-being.